TL;DR: Now that Micro VCs have found their niche in the ecosystem, investors are more willing than ever to support them despite a challenging capital climate. Two ends of the venture investing spectrum attract the bulk of attention. First is big, established firms with assets under management in the nine-to-ten figure range. These firms have been top of mind in the tech and finance communities for decades at this point. But more recently, there has also been an uptick in attention paid to smaller, scrappier VC firms whose coffers are much smaller. 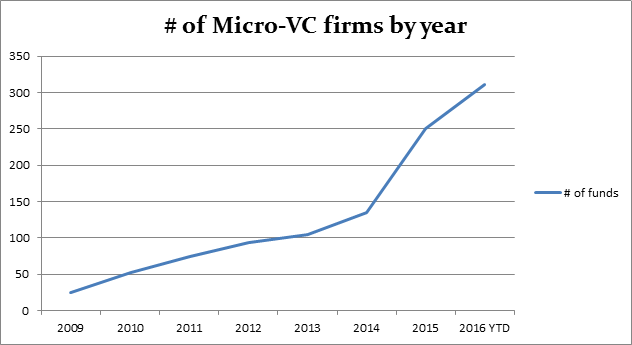 In December 2015, Shaun Abrahamson of Urban.us published “The Micro VCs Are Coming.” Over seven months later we are going to find out what, if anything, has changed in the Micro VC landscape. According to this chart published by First Republic managing director Samir Kaji, investment activity on the general partner side of the Micro VC market is humming along nicely. Since the start of 2016, over 50 new Micro VC firms have been raised. And it looks like the trend is generally up and to the right. All is well, right? Let’s peel things back a bit. A Micro VC has under $100 million in assets under management. The Micro VC makes a supermajority of its investments in seed stage companies. Capital is raised from outside investors (i.e. limited partners) rather than general partners of the fund. According to a recent report from Preqin, there were 501 funds operating globally that meet these criteria as of June 6, 2016. These funds either manage or are looking to raise some $23 billion. Preqin’s findings indicate that Micro VCs make up a large majority of venture funds. 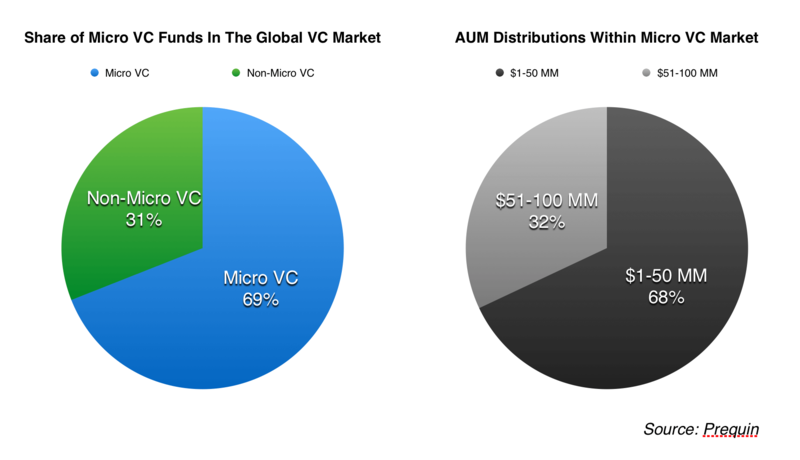 And although $100 million is the upper bound to be counted in this category, funds with $50 million or less in AUM account for the lion’s share of the Micro VC ecosystem. There is a slowdown across the board in venture capital fundraising and investment activity for both general partners and startup companies. According to a recent release from the NVCA, US venture capital firms of all sizes raised $8.8 billion across 67 funds in Q2, with capital commitments down 37% from the first quarter of 2016. The relevant figure to aspiring fund managers is the notable decrease in the number of new funds originated relative to the number of follow-on funds raised by established firms. The number of new funds raised in Q2 of 2016 is 19—less than half of the 34 new funds raised in Q2 last year. Recalling that the bulk of Micro VCs’ investments are made at the Seed stage, what might be more disconcerting are the changes in the market for early stage startup equity. According to recent analysis from Mattermark, the number of Seed stage deals decreased in Q2 of 2016 by 42.4% relative to the same period last year. Comparing deal volume in this quarter relative to last, though, we find a decrease of 61.4%. The Micro VCs Strike Back? It’s hard to imagine a situation where these market forces don’t affect current or developing Micro VC funds. However, despite these headwinds, it appears as though Micro VCs are not experiencing much friction in their fundraising activity, at least through June 2016. The chart above should be heartening to any investor looking to get into the Micro VC game. Through June, 2016, new Micro VC funds saw the lowest level of undersubscription in the last decade. 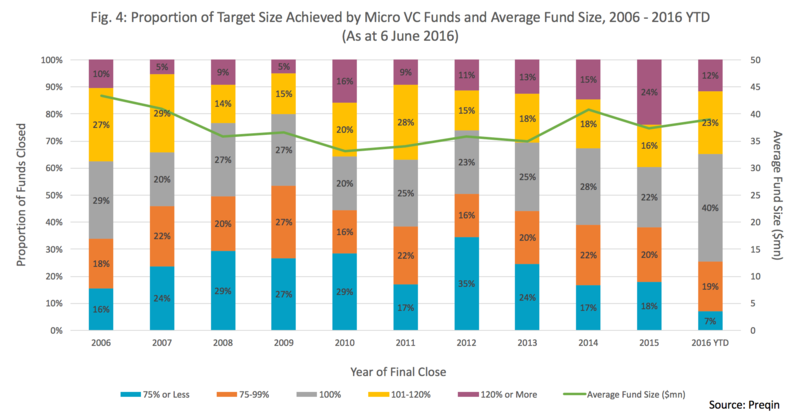 Put differently, three quarters of general partners raising Micro VC funds met or exceeded their target fund size. The appeal of Micro VC funds to investors remains strong. These funds are still a good way for limited partners to gain exposure to more seed stage deals in market niches that larger funds don’t see or lack the incentive to pursue. Despite a challenging funding environment for startups and other categories of venture capitalists, limited partners appear to be more willing now than ever to commit capital to these small investment vehicles. Whether they continue to do so throughout the rest of this year and beyond, of course, remains to be seen. That being said, Micro VC funds now have both a niche and momentum which likely bodes well for them going forward.